Guess who is the topper for the most times in IPL Points Table all Seasons? Surprising data is here about IPL Points Table of all Seasons. After doing some research on the previous seasons of IPL, I have collected this data of IPL Points Table of all Seasons. The 12th season of IPL which is IPL 2019 will be starting in March 2019. The Auction of IPL 2019 is already finished. In the last 11 seasons, we have seen that there are two teams who always have been consistent, Chennai Super Kings and Mumbai Indians. Both CSK and MI have won the trophy 3 times and again they are coming as a strong contender for IPL 2019 Trophy. These two have always manage to make their place on top 4 in IPL Points Table all Seasons. This was the first season of Indian Premier League, established by BCCI in 2007. The season started from 18th April 2008 and the final match was played on 1st June 2008. The final was played between Rajasthan Royals and Chennai Super Kings, Rajasthan Royals defeated Chennai Super Kings. Shaun Marsh won the Orange cap and Sohail Tanvir won the Purple Cap. Now check the IPL points table 2008 below and see who were the top 4 teams in IPL 2008. So this was the first season's points table of IPL. When we talk about IPL Points Table all Seasons, IPL 2008 comes on top. IPL 2009 was the second season of Indian Premier League. The tournament was played in South Africa from 18th April to 24th May 2009 due to general elections in India. The final was played between Royal Challengers Bangalore and Deccan Chargers. Deccan Chargers won the trophy of IPL in 2009. Mathew Hayden was the Orange cap holder and R.P.Singh was Purple cap holder in the 2nd season of IPL. That was the 2nd season's points table of IPL in the list of IPL Points Table all Seasons. The third season of IPL was played in Indian from 12 March to 25 April 2010. This was the first ever cricket game to stream live on Youtube. The final was won by Chennai Super Kings by defeating Mumbai Indians. Sachin Tendulkar won the Orange cap and Pragyan Ojha was the Purple cap holder in IPL 2010. Here is the points table of IPL 2010. The given table in the IPL 2010 Points table. The 4th season of IPL was IPL 2011. IPL 2011 was hosted in India from 8 April to 28 May 2011. In this season there were 10 total teams in the points table. Two new teams Kochi Tuskers Kerala and Pune Warriors India added to the list. This was won by Chennai Super Kings after successfully defeating Royal Challengers Bangalore by 58 runs. Chris Gayle was the orange cap holder in IPL 2011 and Lasith Malinga was the Purple cap holder. So this season had 10 teams in IPL Points Table. IPL 2012 was the 5th season of Indian Premier League. IPL 2012 began on 4th April 2012 and ended in 27th May 2012. The top 4 teams of points table of the tournament were Kolkata Knight Riders, Chennai Super Kings, Delhi Capitals and Mumbai Indians. Kolkata Knight Riders won the final after defeating Chennai Super Kings. Once again Chris Gayle won the Orange cap and Sunil Narine was the Purple cap holder. That is the 5th season's Points table in the list of IPL Points Table all Seasons. Indian Premier League 2013 is also called as Pepsi IPL 2013. This was the 6th season of Indian Premier League. For the first time, Mumbai Indians won the tournament defeating Chennai Super Kings by 23 runs. Total 9 teams were in the points table this year. Michel Hussey was given Orange cap for most runs and Dwayne Bravo was given the Purple cap for most wickets. Here is the IPL Points Table of 2013. That is the complete IPL 2013 Points table. There were 9 players in IPL 2013 Points Table. This year featured 8 teams in IPL. IPL 2014 was the seventh season of Indian Premier League. Pune warriors Indian discontinued to play this year. IPL 2014 was held from 16th April to 1st June 2014. The first 20 matches were held in UAE due to General elections in India. It returned to Indian on 2nd May 2014, so all the left matches were played in India. The final was played between Kolkata Knight Riders and Kings XI Punjab and Kolkata won the title for the 2nd time defeating KXIP. Robin Uthappa was the orange cap holder and Mohit Sharma won the Purple cap. Here is the IPL points table of 2014. 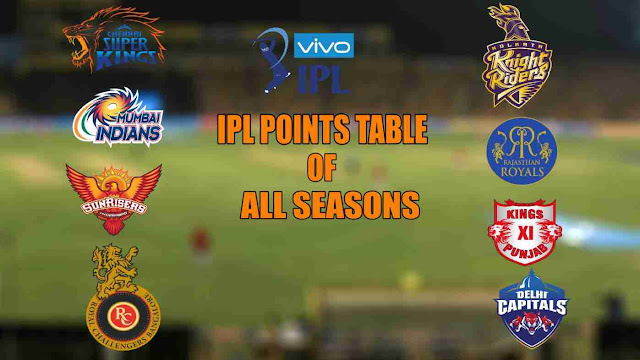 That is the Points table of IPL 2014, which was the 7th season of the Indian Premier League. IPL 2015 was the 8th season of Indian Premier League. There were 8 teams in IPL 2015 and it was held from 8th April to 24th May 2015. Mumbai Indians defeated Chennai Super Kings by 41 runs in the final, and won the title for the second time. David Warner was the Orange Cap winner and Dwayne Bravo was the Purple cap holder in IPL 2015. Check below the IPL Points Table of IPL 2015. So that is the point table of 2015 in the list of IPL Points Table all Seasons. IPL 2016 was the 9th season of Indian Premier League. This was also known as Vivo IPL 2016. This season began on 9th April 2016 and ended on 29 May 2016. The final was played between Sunrisers Hyderabad and Royal Challengers Bangalore. Sunrisers Hyderabad defeated Royal Challengers Bangalore. Virat Kohli scored the maximum number of runs (973) in the tournament and won the orange cap. Bhuvneshwar Kumar was purple cap holder with the most number of wickets taken. Here is the complete IPL 2016 Points table. Thus it was 9th season's IPL points table. After CSK and RR being banned, Two new teams Gujrat Lions and Rising Pune Supergiants were added to IPL Teams and IPL points table. Indian Premier League has finally completed 10 years successfully. IPL 2017 was the 10th season of IPL. This tournament has eight teams same as previous year. The final was played between Rising Pune Supergiants and Mumbai Indians and Mumbai Indian won the IPL title for the third time by 1 run and created history. SRH Captain David Warner won Orange cap for the most number of runs and Bhuvneshwar Kumar same from SRH won the Purple cap for the most number of wickets taken. IPL points table of season 10 is given below. So IPL season 10 Points table also did not have two strong teams CSK and RR because they got banned for two years. IPL 2018 is the most recent IPL which was held last year only. This was the 11th season of IPL. Chennai Super Kings and Rajasthan Royals also came back in IPL 2018 after two years ban, so they are also in IPL Points Table. The tournament was held from 7 April to 27 May. The final was played between Chennai Super Kings and Sunrisers Hyderabad. Chennai Super Kings made a superb comeback and they won the title for the third time. Kane Williamson was the orange cap holder and Andrew Tye from KXIP was the Purple cap winner in IPL 2018. Check below IPL points table of IPL 2018. So that is the IPL Points table of the 11th season. CSK once again has shown their strength and proved themselves as champions. After looking at the IPL Points Table all Seasons we can say one thing, the most consistent team in IPL is Chennai Super Kings. They always managed to make their spot in top 4 in IPL points table. Also, check IPL Most Expensive Players in All Seasons. Which teams will be on the top 4 spots in IPL 2019 Points table according to you?